Chris Duarte : Stratocaster Warrior ! The next time you hear somebody say, "Gee, I'd give anything to play guitar like that...", just ask 'em if they'd be willing to bleed. Chris Duarte is willing-- and sometimes he does, as this photo reveals. But that's just the way those Texas boys are. They take their guitar playing serious! Although that could just as easily be BBQ sauce on the Strat, because Texans also take their BBQ serious. I'm giving Chris the benefit of the doubt though since, "he plays heavier than he weighs". 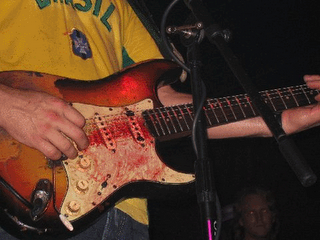 Is it possible that Strats get meaner, once they have the taste of blood? I wouldn't be surprised... Seriously though, when it comes to getting great Strat tones, both in the studio and on stage, Chris Duarte speaks fluent "Strat-o-nese". Check out the audio clips on Chris' Myspace page, and tour dates here. Oh yeah, if it IS BBQ sauce, it must be "STUBBS"!